A new survey, “Travel Improves Educational Attainment & Future Success,” explores the impact of learning-focused travel on academic performance and career growth. The findings demonstrate travel’s power to transform how students approach learning, deepen their understanding of the world and expand their career possibilities. The Wagner Group, a market research firm, conducted the study by surveying a cross-section of 400 American adults who reported taking an educational trip between the ages of 12-18. The sample carefully balanced across considerations of gender, race and income. An educational trip was defined as any domestic trip taken when the person was between the ages of 12-18 that involved learning about the history or culture of the area visited, either as a school or family trip, and was at least 50 miles from home (one-way) or had an overnight stay regardless of mileage. Regardless of socioeconomic class, the positive effects of youth travel extend far beyond the classroom educational travel correlates with two of the markers most commonly seen as indicators of success: higher education and personal income. Nine out of ten people who took educational trips during their youth say the experiences helped their education or careers. Adults who experienced educational travel as teens have a median income $5,000 higher or earn 12 percent greater personal income annually than their peers. Increased travel is linked to higher education, regardless of gender, ethnicity or other demographic factors students who took educational trips were more likely to graduate from high school, attend college and go to graduate school. A majority of adults (57%) who took educational trips as children and teens attained a college degree or went on to do post-graduate work, compared to those who did not (33%). Nine out of ten people who took educational trips say the experiences helped their education or careers. Many survey respondents noted that travel makes learning come alive, sparking an interest where none existed before. As a result, children who took educational trips had higher grades and were significantly more engaged in learning, both in and out of school. Educational travel makes school more interesting for 8 in 10 students. 86 percent say travel in their youth made them more intellectually curious not only in school, but outside the classroom, as well. Respondents report that travel during their school years made them more interested in what they were learning in school, making information easier to remember and making complementary reading and lectures more interesting so interesting as to even spark independent learning. The experiences provided by these types of trips were a vital part of a complete education according to 83 percent of respondents. 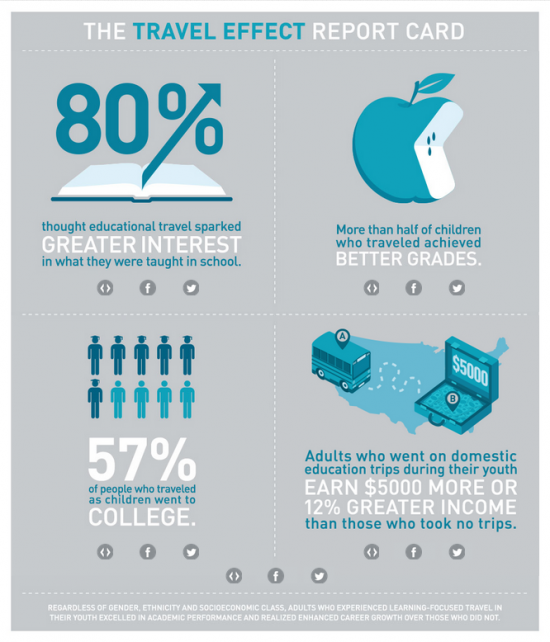 For 80 percent of those surveyed, educational travel sparked greater interest in what they were taught in school. 85% of adults who took educational trips in their youth say the travel made them more connected to American heritage. Experiencing local culture and history on their trips had a lasting impact (77%).